3 Myths About HVAC and Solar Energy | Sierra Pacific Home & Comfort, Inc.
For those who believe in renewable energy, solar energy is all the rage. And for those who aren’t? Well… They certainly have many reservations against them. And not all of them are entirely based on fact. There are many myths and misconceptions about solar energy that we believe are preventing people from taking the plunge. In this post, we’ll go over just three myths about Solar Energy. This is one of the largest misconceptions about solar energy. The idea is that a solar panel will only collect energy properly during a blazing hot and sunny day. In reality, the heat has little to do with the process! Solar panels work by converting the sun’s rays into electricity. Even on cloudy days, the sun’s energy will still reach the panels. If this weren’t true, then Germany wouldn’t be one of the leaders in solar energy despite its reputation as a country that stays cloudy and rainy all year round. Plus, it turns out that cold temperature is actually better for solar panels. The cold helps the panels conduct electricity better, thus making it flow more efficiently. There’s no feeling quite as frustrating as installing a big, complicated solar energy system just to give it away a few years later. We understand completely! However, the return you’ll get back on your solar energy is quicker than you think. When factoring in federal tax credits and incentives, your return on investment will take about 4 years at the maximum. Of course, this means you have to be diligent about using those incentives and credits, but any Sacramento solar service would be eager to help you with that. Still not convinced? Don’t worry. Even if you move out of your home earlier than expected, the solar panels will increase your home’s resale value by amounts nearing $15,000. Whether or not you think solar panels look good isn’t a myth, of course, as much as it is a subjective opinion. 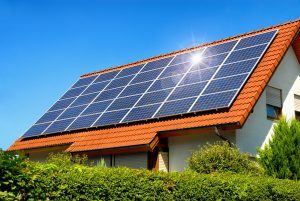 Even if we can’t convince you to look at the financial benefits instead of the aesthetic ones, you can work with your HVAC contractor to have the solar panels installed on a part of the home that won’t make them as noticeable. Depending on your property, you might get away with being able to install them on the ground. As for potential damages to the roof, it’s much like any other kind of service: the potential risk of damage increases with the technician’s lack of qualifications. Asking a handyman or a contractor without much experience with solar panel installation comes with an equal amount of risk. An experienced professional, however, will have enough skill to install the panels at the proper angles and distance from the roof’s surface to avoid damage. Still not sure about solar energy? One of our solar experts would be happy to speak with you. Contact Sierra Pacific Home & Comfort, Inc. today for a consultation.